Two weeks ago I see this unruly event message from Milwaukee Alt about some month long gallery night. I go, miss mostly everything and have a great time anyway enjoying the wake of making. The taste that making makes, matters, it might not fit every flavor. 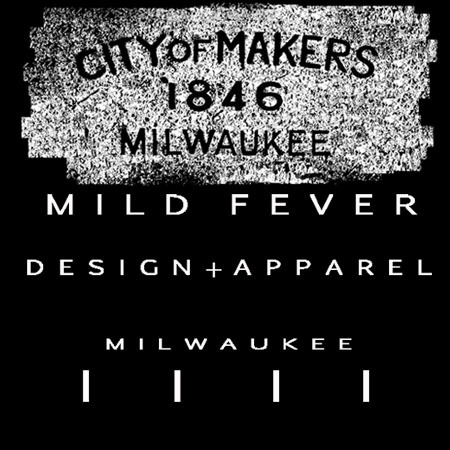 In the glut of creativity Milwaukee produces these days, you can get disgruntled and caught in the affections of cynicism. Those feelings, give fad to critics. Commit to what you believe, Outer Inspirations does. Proprietor and tattoo artist Mac MacDannald’s talents hang from the walls touching the 20 foot ceilings, with paintings of all sizes teasing the imagination in folk and pop art from. Presentation stands out in one set of works employing a primary color pallette incarnating shadily interesting illustrated characters, contrasting completely the deep stained wood tones of the backgrounds and frames. Mac’s partner in the creative arts, Tarah Mueller contributes dearly to the Outer Inspirations gallery installation. Immense and majestic portrait images fusing fantasy and alternative aesthetics with traditional brush techniques cling to retinas through dilated pupils. Sullen and rich colors together subtly radiate to all corners of her canvases, giving immortality to highly seductive heroine subjects. Milwaukee Alt’s, founder Ryan Laessig leaves his impression on the show as well with several portraits from his growing body of work in alternative fashion photography. Laessig’s work was recently featured in Gorgeous Freaks magazine, his lens challenging notions of traditional high end fashion beauty, and his models come as they are, striking in their appearance and attitude. Outer Inspirations Closing Gallery Night, June 30th, 7p, 823 N 2nd, West Town, The Triangle featuring work by Milwaukee Alt, Outer Inspiration’s Mac MacDannald, Tara Mueller, Nick Kurszewski, Matt Nadolny, Juliet Jaeger, Damir Zoric, William Arthur and Amber Michelle Russell. Besides the obvious artistic viewing pleasure, there are many accessibly priced prints, original art, fashion clothing and accessories (including a nice selection of gauges) available for purchase. This entry was posted on June 30, 2012 by L.S. Trolley. It was filed under Visual Arts and was tagged with art exhibition, artist p.a..